The renovation of Moore Square is very much underway with a lot of small shrubs and short trees being removed. The holidays were a distraction but I noticed the difference recently and just had to grab a photo. In the winter, with the leaves off the old oak trees, you can really see right through the square which makes it feel a lot bigger than it really is. Wow! 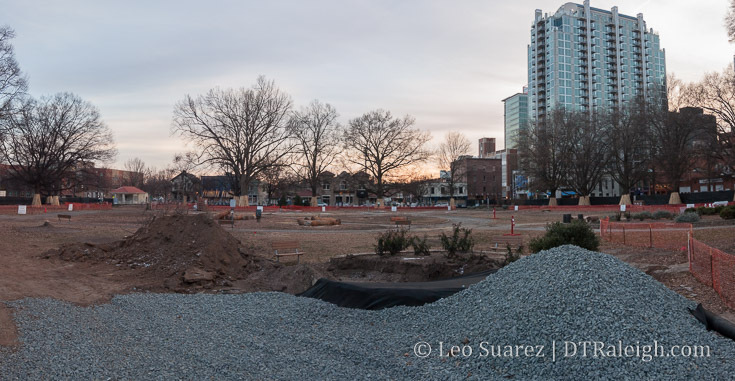 Moore Square looks almost unrecognizable! Wowee … 599K for a 2br/2ba condo with 1387SF! I can see why all the RE agents shown in the ad have smiles on their faces. Beautiful place though … gotta admit. Thank you Leo for the great picture, as always! And thank you for keeping us up to date on this very exciting (to me at least) and potentially neighbor changing project. Did you see the townhomes they’re building beside it–in BROWN bricks?! Yuck. It looks so Mid-Century dated already and it’s not even finish. Can’t believe it’s basically all sold out. There’s a lot of land in Moore Square. I sure hope that this renovation does it justice. As for nearly 600K for that Fairweather condo, remember that you also get a view of the substation across the street from the second floor. I just looked at the Fairweather website. There’s a nice rooftop terrace on the non-DT view side that gets mostly blocked by the penthouses and the building lacks any sort of community room and a pool. There is a gym but it looks really tiny. The units themselves better be pretty darned spectacular for that price.